A “COMPLETE AND catastrophic failure” is how Fianna Fáil’s Stephen Donnelly dubbed the National Paediatric Hospital Development Board (NPHDB) and their role in overseeing the construction of the new children’s hospital. The chairperson of the board, Tom Costello told the Oireachtas Health Committee today that “if they were to start again on a project of this scale and complexity we would adopt the same procurement approach”. 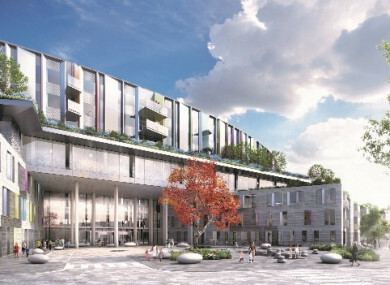 Defending the additional construction costs of the new children’s hospital, chairman Tom Costello is expected to tell the health committee that the “right procurement strategy” had been taken. The committee will hear that the final project cost is now €1.433 billion – that’s €450 million higher than the figure of €983 million approved by government in 2017. The cost is expected to rise, with the Taoiseach confirming that other health projects will now be impacted, with some expected to be delayed a number of months. Donnelly accused the board of failing in its job to the State. He said when the dust settles, he does not believe there will be much change out of €2 billion – stating that the project will most likely be €1-€1.5 billion over the original estimate, in his view. He went on to ask if there was any accountability for the overspend, asking if anyone had lost their job over the massive overrun or if any commercial contracts had been cancelled. Donnelly was told by the board that no one had been sacked over the projects cost overruns. Representatives of the NPHDB will appear before the committee today to explain the massive cost overruns. Costello will tell politicians today that he is “satisfied” that the board and executive team have set about the task of delivering the children’s hospital “in a competent and professional manner by putting in place the most appropriate structures and processes based on best international practice”. Notwithstanding this we are deeply disappointed and acknowledge the very significant cost increases and the challenges these pose. There are lessons to be learned in relation to the wisdom of pursuing cost reductions on competitive tenders and ensuring the sufficiency of tender information, in particular, mechanical and electrical services at tender stage. A document given to committee members attempts to shine some light on to how costs got out of control. It states that in 2016, at the first stage of the tender for the project, the lowest bid of €637 million was received from the company BAM, which Costello describes as “very competitive” and some €131 million lower than the second placed bid. However, as of 2017, the final project brief states the total capital cost was €983 million. Costello states additional costs then became apparent. notwithstanding the extremely keen tenders which were received. The capital cost of €983m included an aspirational amount of €66m for cost reductions/value engineering. “An additional cost of €61 million was reported mainly relating to Fire Officer requirements including Sprinklers and costs associated with programme alignment between main contractor and specialists,” Costello will tell the committee today. As construction costs jumped, so did design costs, according to Costello. As the design development progressed from October 2017, the design of earlier packages such as concrete frame, steel frame, stone cladding, internal walls were completed and costed and were trending within expected costs. However, this changed in mid 2018 as the design for mechanical and electrical systems were completed. The board considered going down another route to get a better deal. became clear that the option to award Phase B (the design work) to BAM would result in the lowest cost and fastest completion”. requirement for extended programme and associated costs. Working closely with the project team we scrutinised all costs as they became clear and we endeavoured first to deal with increase in construction cost of €320m. The process of determining the costs of the various packages was fully interrogated, independent reviews were commissioned. The following outlines the overruns of €320 million in expenditure, stating that a number of “omissions” in the original design were made. As well as the increase in construction cost of €320 million, there are additional costs of €130 million relating to VAT (€50m), and additional costs relating to the satellite sites, staff, site supervision, design team, medical equipment, risk/contingency. Work in the Department of Health is underway as to where the additional money will come from. Email “No one held accountable as children's hospital board says it would do the same again despite cost overruns”. Feedback on “No one held accountable as children's hospital board says it would do the same again despite cost overruns”.